Judging from the list of ingredients, this recipe looked like it would be good, but it was just all wrong. 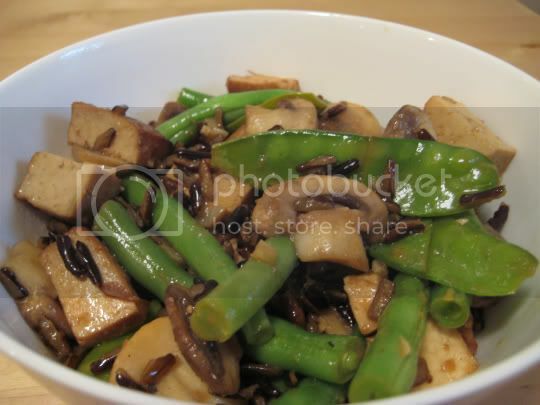 There are some very odd combinations going on here: wild rice and green beans and mushrooms (sounds like the makings of some kind of pilaf) with snow peas and tofu and soy sauce (Asian indeed). I liked the idea of the lemonade concentrate for an added sweetness to the salty soy sauce, but that was about it. Maybe it's the fact that I'm not crazy about sesame oil, as I think it overpowers all other flavors of a dish with a strong, burnt taste. Overall, this was not what I was hoping for. Make again? No. I took a few bites and threw the rest away.